As I’ve mentioned in a previous post, leftover fishing line can be a big problem in coastal communities throughout the United States and the world. Leftover line is nearly invisible to wildlife, who can get tangled up or actually ingest the mono-filament, both of which leads to injury, reduced reproductive success, and death. Fishing is a huge part of the local community and economy in Destin, Okaloosa Island, and Fort Walton Beach, known together as the Emerald Coast. The charter fishing fleet is the largest in the country, plus surf and pier fishing are popular. As a result, mono-filament line is often found in the water and along the shore. Recently, Okaloosa County staff and the Choctawhatchee Basin Alliance (CBA), an environmental non-profit, teamed up to try to address the problem. CBA donated two large PVC pipes, coordinating with an artist to paint them in beautiful marine scenes, including mermaids, native bird species, and sea turtles. Once lacquered by an Okaloosa County Parks Division employee, they were installed at a park’s boat ramp and at the Okaloosa Island Fishing Pier, which extends into the Gulf of Mexico. The mono-filament collectors are attractive, drawing in visitors and educating them on the importance of preventing fishing line litter. After fishing, anglers deposit leftover line into the tubes, where it remains until a CBA volunteer empties everything. As a final step, the line is shipped to a recycling facility, thereby avoiding the landfill! 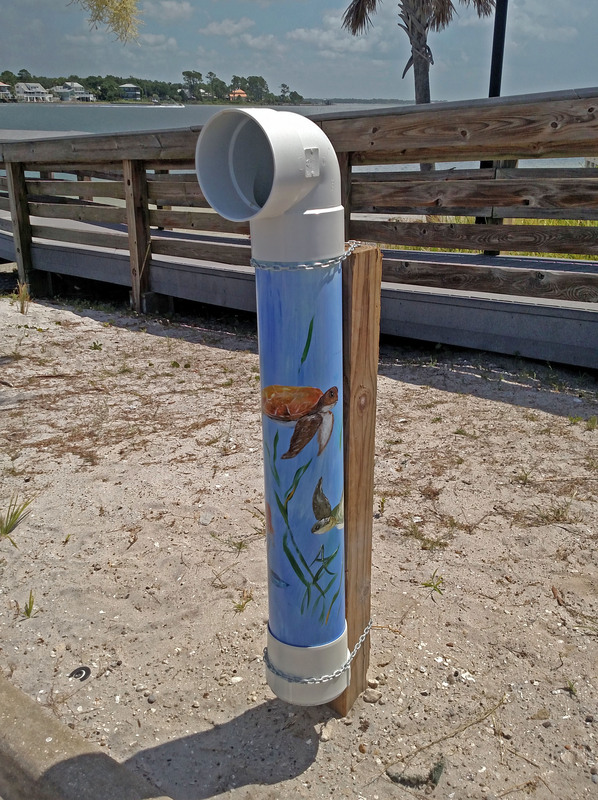 A simple, decorated tube creates social, environmental, and sustainability benefits. 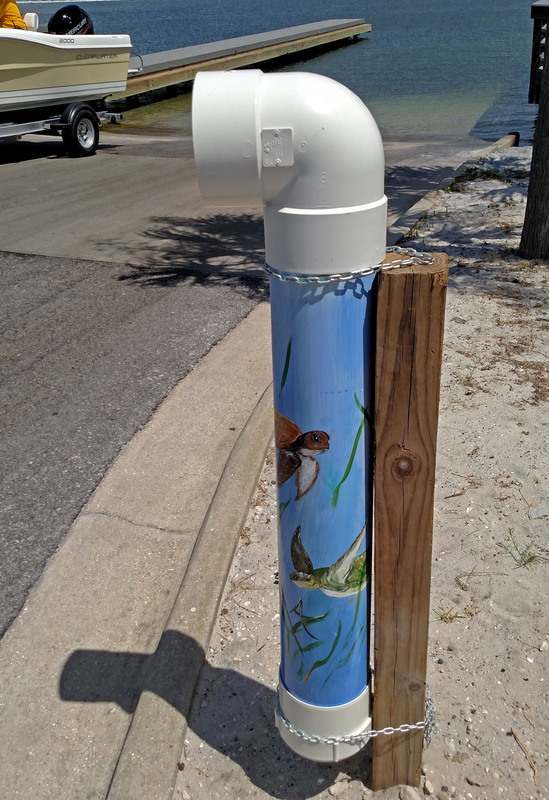 Now that the first tubes have been installed, the county and CBA are working together to construct many more for other piers and the popular Destin Harbor. While they will not solve the problem of fishing line in the environment, we hope that wildlife entanglements can at least be reduced, and that the educational benefits of the collectors will transcend our community.